This is probably wishful thinking more than anything else (in the hope that one day my collection of old bikes will be large enough to warrant such a page! ), but I thought I’d make a list of my motorbikes past and present anyway. They are presented below in chronological order of when I bought them and you can click on the photo’s for more details on each particular bike. 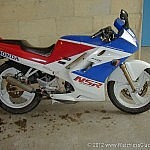 My first motorcycle was a sporty little Honda NSR125RK that I had before I could afford a car when back at university. It was a great looking little bike, sort of like a mini Fireblade and pretty quick for a little 125cc two-stroker. When it went it went really well, but sadly it was off the road with electrical and mechanical problems for nearly as much time as it was running. From memory it was a H-reg 1990 model and I eventually sold it when I was given my first car. More details on this bike can be found here. 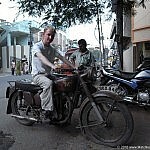 After a long break from the world of two-wheeled transport, I bought a 1951 Matchless G3LS 350cc single whilst living out in India to get back into biking. I was originally looking to buy an old Enfield Bullet and had never even heard of ‘Matchless’ at the time, but then I came across one for sale in original unrestored condition with some great patina and paintwork and fell in love with it. This bike is really what this website is all about so you’ll find lots of information and photos if you have a bit of a search around, especially in the blog. More details can also be found here. 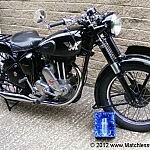 Whilst back in the UK recently I had the chance to by a 1949 Matchless G3L as a stable-mate for my original G3LS. This is a great looking bike which I’ve admired for a while after seeing some photo’s online, so when the opportunity to buy it came up recently I couldn’t. It’s a couple of years older than my other Matchless G3 and the main difference is that it’s a rigid frame model so no suspension at the back. Currently it’s in pieces part-way through a full restoration, so more details and photographs will follow shortly. The photograph shows how it looked before the previous owner started the restoration so you can see that it looked pretty good already. More details on this bike can be found here. Great site, I wondered if you have ever recovered a seat? I’ve just got my foam from ‘Leighton’ and am about to start on my Model 31. If you have any tips would be very useful. I have recently purchased a matchless g80c road going version (?) so like you i am clueless at this stage but want to say thank you for your site which is a great inspiration . Like you I am an ex-pat living in now what is Zimbabwe (for the past 60 odd years in Africa). I have seen that there are conducted tours in Zambia on classic bike to raise money for charity.Maybe one day you may visit here and either ship your bike or given time i may be able to lend you mine when i’ve sorted it so don’t hold your breathe. I’ve owned Matchless’ for a long time. I’ve had an on & off love affair with them since the 1960’s. My preferred period is the late 1920’s and early 30’s, mainly the 250cc ‘R’ & 350/500cc ‘T’ series as they share many common parts. I’ve watched your site since the beginning but as your interest lay with post war bikes I just stayed lurking. We have however a mutual friend in John Clement who has told me of your upcoming activities so I thought I’d introduce myself. My other interest is elderly two-strokes, mainly Villiers powered bikes which I believe also had a presence in India. I have recently acquired 2 matchless motorcycles as part of an estate collection that I am selling. Do you happen to know what these bikes are worth in pristine condition…and/or any prospective buyers?